Security Bed Rail - Home Style Bed - Single Rail - 30"
Sleep without worry! 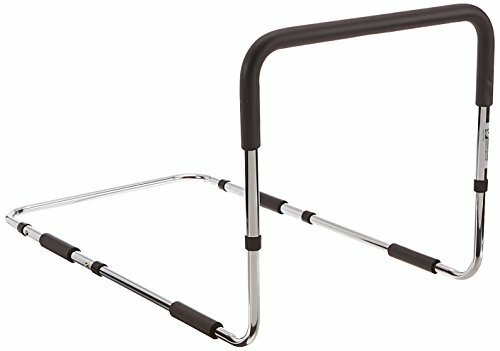 This sturdy bed rail provides safety and security for users. This is the single rail model please see model 5085 for double rails. There are also models available for electric (Craftmatic) beds, see models 5075M and 5085M. 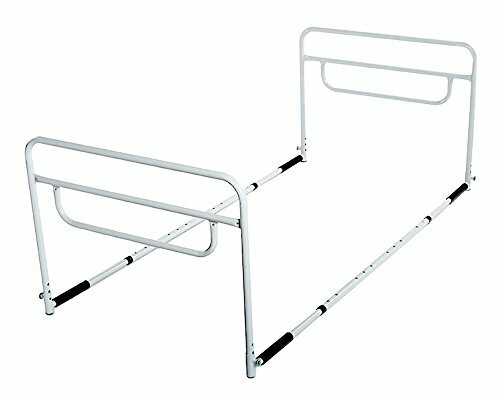 The Endurance Hand Bed Rail is designed to help users get in and out of bed. Unit includes a securing strap to attach rail to bed frame. Height adjustable from 17" to 21" with a 20" wide, non-slip hand grip. Will break down for travel and will fit in most large suitcases. Easy to install between mattress and box spring with tool free assembly. Will fit most beds and extends 3' under mattress w/non-slip sleeves to keep it in place. 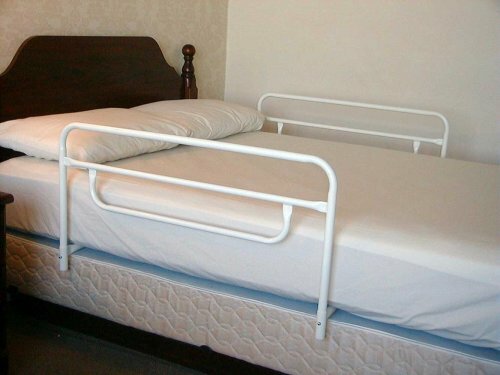 WARNING: The Endurance Hand Bed Rail is not intended or designed to ensure that the user is confined to bed. 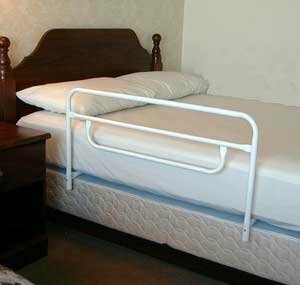 If the user is at risk to roll out of bed, a hospital style bed rail should be used. 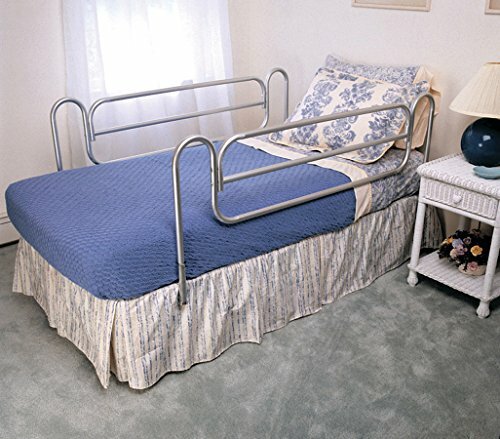 The Endurance Hand Bed Rail is designed to help the user get in and out of bed safely. SPECIFICATIONS: User Weight Limit: 300 lbs. Security Bed Rail - Home Style Bed - Double Rail - 30"
Helps keep individuals in bed and reduces the risk of injuries from falling. 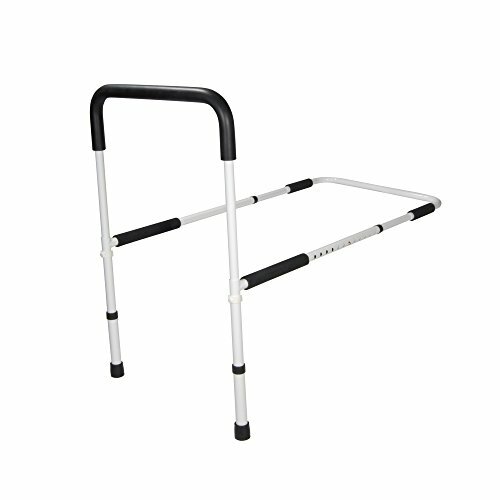 Rails easily lower by depressing snap button to provide easy access for the caregiver. Made of steel and powder coated in off white to match any decor. Fits up to full sized home style bed. Easy to install, no tools required. Weight capacity 250 lbs. 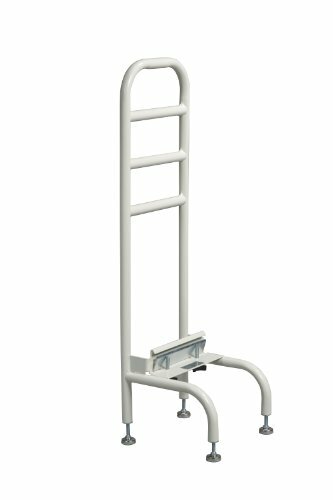 The RMS DUAL Adjustable Height Bed Assist Rail from Royal Medical Solutions makes getting in to and out of your home-style bed easier. You will have the utmost safety in bed since the dual rails attache to both sides of the bed. Both rails simply slide underneath the mattress and it includes "non-slip foam" that helps hold the rail securely in place. The removable handle on each side of bed is made of powder coated premium steel that is strong, durable and easy to clean. The unit can be assembled quickly and tool-free. The installation instruction is included in the package. RMS Home Bed Rail is the best-in-class bed assist rail. With the Sleep Safe Bed Rail from Signature Life, you can sleep easy knowing you have the support you need. It offers stability while standing and can be extended to prevent nighttime falls. It also pivots down and out of the way when not in use to maintain the comforting feeling of your bedroom. The chic design and faux leather pouch make this bed rail the perfect mix of safety and style. 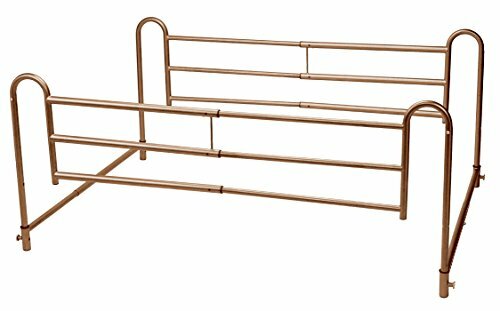 The Sleep Safe Bed Rail is the most attractive and versatile bed rail you will find. Looking for more Home Style Bed Rails similar ideas? Try to explore these searches: Wood Shaker Bookcase Cabinet, Elbow Pack, and Quint Set. Shopwion.com is the smartest way for comparison shopping: compare prices from most trusted leading online stores for best Home Style Bed Rails, Mercerized Cotton Blend, Water Purification Filtration, Rails Bed Style Home . 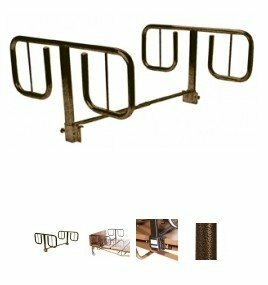 Don't miss this Home Style Bed Rails today, April 23, 2019 deals, updated daily.